In Dec 2009, I was busy shopping for my Wedding. I had got the suits and dhoti's I needed. Only thing that was pending was the Wedding ring. I'm not a fan of gold or jewellary but decided that I will be wearing the wedding ring more often. My requirements were, I wanted to get a simple circular ring and wanted to emboss characters in it. We started the hunt in Chennai. Most shops here did have a circular ring but did not have custom character embossing in them. Few of them were only able to carve the name in the ring, that was machine done so only standard character fonts were available. Finally my mom suggested to try Kirthilal, Coimbatore. After speaking with the sales guy there I was introduced to an elderly man. Soon the sales guy started gesturing that I wanted a circular ring. Yes, the elderly man was physically challenged (he could not speak and hear), though he had excellent lip reading skills and a god's hand in drawing. He has worked as a jewellary designer close to 18 years. I then gestured to him what my requirements were, he then drew a three dimension of the ring alone. Whola! Perfect. I was then asked to write the text that I wanted in it, I wrote them in small case. 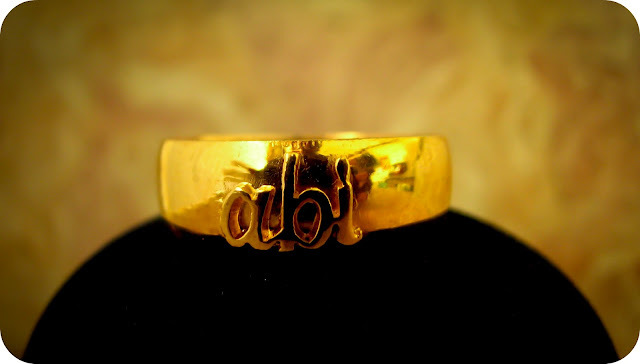 He then made small touch up and redrew the ring again in 3d with the name in it. That was all, my ring got delivered precisely as I had asked for. Well, that was the story of my ring. What is yours?